One of my favorite things about being a blogger is trying new things. The newest review item comes via Purex Insiders! Its the New Purex PowerShot no mess bottle! Just open the cap, flip the bottle upside down to deliver a dose of the detergent. Flip the bottle back upright and you are done. 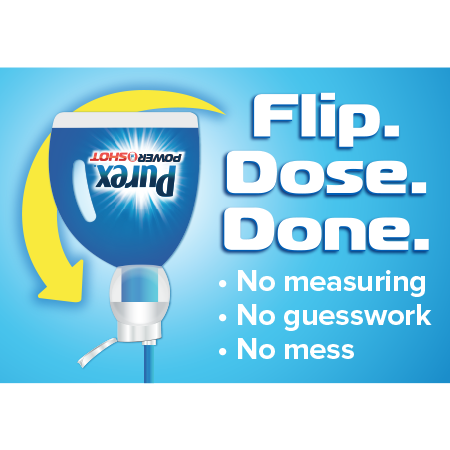 Purex PowerShot detergent does the measuring for you!! I like that it measures for you!! What a great way to save detergent!! The bottle I received for review is good for 45 loads!! With a big family like mine it should last us about 2 weeks! I tried it with my laundry today and the clothes smell so good! There was no mess to clean up from spillage like other detergents with cup lids. so that I could get on with the other household chores. 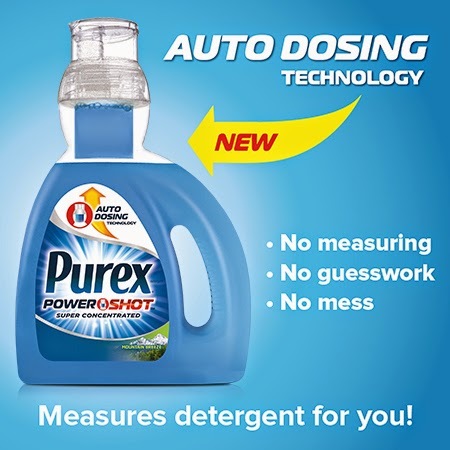 I give this new Purex PowerShot a 5 out of 5! Mountain Breeze and Natural Elements Linen and Lilies! PowerShot will be available in stores starting Feb 2015. 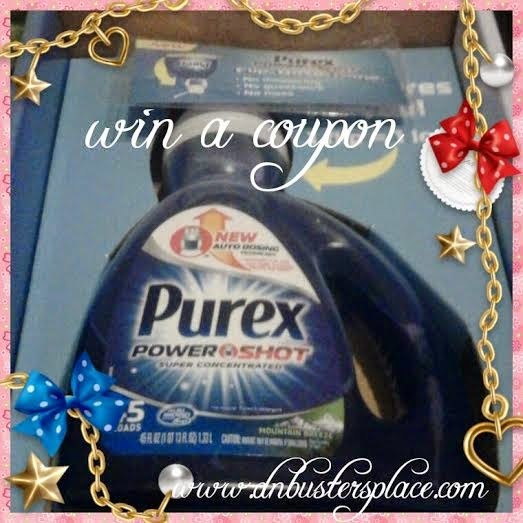 Here is your chance to try the New Purex PowerShot for yourself!! 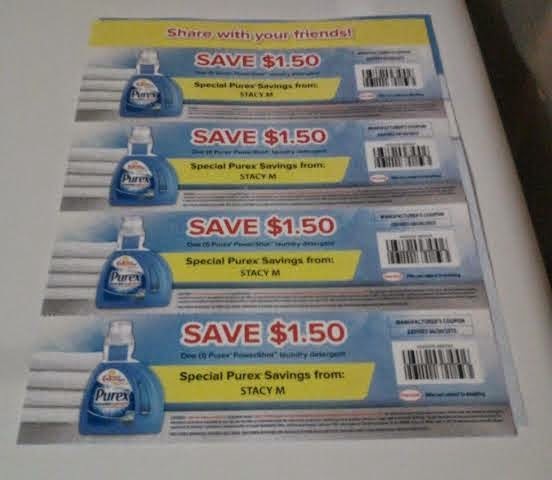 coupon for $1.50 off a bottle of Purex PowerShot. Note: This post may contain a sponsored/affiliate/referral link. Thank you for supporting this site! 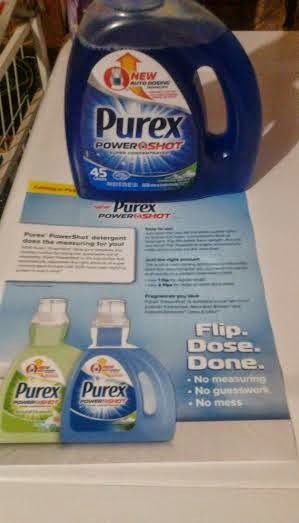 The Purex brand provided me with a sample of Purex PowerShot deteregent in exchange for a product review. However, all opinions in this post are my own. Today I have done 0 loads of laundry - but it's all waiting for me tomorrow! I have done 2 loads of laundry today so far. I have done zero so far. Only because I was at work. Guess what I am doing this evening though! Probably 2-3 loads. I have done 1 load today. I did laundry yesterday so I did zero loads today! I do 2 loads a day and i did 4 today because of towels and sheets. I am on load 3 and still going! I haven't done any laundry today, but two loads are in my future. I have not done any laundry yet, but later today I'll have about 3 loads to do. I haven't done any laundry today. I have not done any laundry today. I didn't do any today but I did two loads this week which is about normal for me. We've done three loads today! I have done 2 loads of laundry today. How many loads of laundry have you done today? I plan on doing one load of laundry today. Just 1 so far...need do a couple more though. I did 2 loads today! Thankfully, I have no laundry to do today! Yea! I have not done any yet today! Will probably get a load going after dinner! I did 3 loads of laundry today. I'm currently on my third load. I have done two...but should have done about 6! I didn't do laundry today. I have already did two loads of laundry today! I haven't done any today as we went out shopping but I only do a couple of loads a week. I have done 2 loads of laundry today! I have not done any yet today, but have two loads for tonight! Today I Did 4 Loads Of Laundry. No laundry today - but it's staring to pile up! I had a lot going on so got none done today. I did two loads today! I have done 4 loads today! I did two loads yesterday! I have done 0 Loads of laundry today! I have to admit to being lazy so far....none today. Should I have done some? Of course, lol. Today none, but this morning, my sweetie wanted to do a couple of loads. Today I did 3 loads! I did zero today. I usually do 1 load every 2-3 weeks. I did one load today.